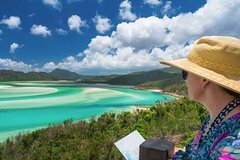 Many visitors make the mistake of thinking the Whitsundays is just made up of the islands off the coast of Airlie Beach, when in reality there is just so much more. As well as 74 inhabited and uninhabited islands, the Whitsundays is also made up of a large stretch of the mainland coastal area. Within a short drive you’ll find magnificent forests, calm white beaches, friendly townships, fishing spots and a number of attractions with excellent facilities. From Bowen down to Laguna Quays and inland to Collinsville, there is plenty to see and do without ever crossing the shoreline. Situated on a peninsula that extends out into some of the most stunning blue waters in Australia, Airlie Beach is more than just a gateway to the Whitsundays Islands. It’s a vibrant holiday town full of luxurious resorts, convenient holiday apartments and bustling hostels & backpacker accommodation. There are plenty of day trips out on the water and to the islands you can take from Airlie Beach, as well as tours of the mainland beaches and tourist drives. When you're staying at Airlie beach though you can end each day relaxing in town with your choice of any one of many restaurants, bars and entertainment venues. The Whitsundays is thriving with life. From lush bushlands to tropical rainforests, extensive birdlife, dingos and even crocodiles! Take a tour of the Proserpine River Wetlands where you’ll see a wonderful diversity of local flora and fauna including migratory birds that visit the wetlands every year. 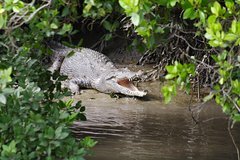 There are also crocodile watching tours that offer you a display of these ancient creatures in their native habitat. Conway National Park has two major walking trails that present a whole world of virtually untouched Australian wildlife. The Kingfisher Circuit is a short 2km round trip that takes about an hour to complete. It can be quite steep in parts but you won’t even notice the climb as you pass by a myriad of rainforest plants like strangler figs, tulip oaks and basket ferns. The Whitsundays Great Walk takes you through magnificent tropical rainforest, along and over seasonal creeks and up to lookouts with spectacular views of the Whitsundays Islands. The entire walk takes about three days with campsites along the way, but you have the option of staying in local accommodation and breaking it up into shorter day walks if you prefer sleeping in a warm bed. Not far from the National Park is Conway Beach, a perfect spot for fishing and crabbing, and home to a number of major fishing events throughout the year. Further north is Dingo Beach where there are miles of sandy beaches, crystal clear waters and even more great fishing. Perhaps the most interesting beach is the one at Bowen, where the coral reefs are so close to the shore you can simply swim out to see it - no dive boat necessary. Whitsunday Crocodile Safari is a safe, all-weather nature excursion which takes guests to see crocodiles in the wild in the Whitsundays. The safari enables you to explore the estuaries and wetlands of the Whitsundays and to discover the vegetation and wildlife in these unique habitats. Your tour begins with a courtesy bus transfer from Airlie Beach to Proserpine. You will experience a calm water cruise on Proserpine River, spotting estuarine crocodiles in natural habitat, and then explore Goorganga Plains wetlands on a tractor-drawn wagon train. Your day tour includes a delicious barbecue lunch and traditional billy tea and damper, so have your camera and your appetites ready! The Proserpine Museum offers a historic look into the Whitsundays region and the surrounding communities. You can learn about the region’s agricultural & industrial origins, military history, local artists and multicultural communities among many other displays. There are a number of activities for children to keep them entertained and invoke their curiosity. Stocked every year with over 20,000 Barramundi, the Peter Faust Dam outside of Proserpine is an incredibly popular spot for keen anglers. A wonderfully scenic location that enjoys regular sea breezes. The man-made dam is also home to camp sites and boating activities. When most people think of the Whitsundays (and in particular, where to book accommodation), it's generally the offshore island resorts on Hamilton Island or Daydream Island that come to mind. But, what many people don't realise is that the Whitsundays mainland has many great resorts and accommodation options that are just as breathtaking and more competitively priced than the luxury resorts situated out in the Coral Sea and Great Barrier Reef. Explore the beautiful Airlie Beach and Pioneer Bay by jetski - take a tour with qualified guides through Pioneer Bay and enjoy spotting the marine life including sea turtles and the occasional dugong. The tour is approx 90 minutes in total and departs from Abel Point Marina.